UP TO 50% PROVEN ENERGY SAVINGS WITH PATENTED NEW TECHNOLOGY. Basics of electric radiant heaters Infrared radiant heating panels use the same principle as the sun. It is easy to feel the difference between having the rays hit your body and when they stop (for example when the sun is blocked by a cloud). The rays of the sun do not mainly heat the air but the bodies they hit. The sun is the world’s best heater. The rays used for heating are the infrared rays. Based on this argument, the best radiant panel heater is one which produces the maximum amount of infrared rays. Only when a panel works efficiently and uses the advantages of the sun described should a heater be legitimately called an infrared heater. However, since infrared radiant heating has become very popular the last years, more and more electric heaters try to market themselves as “infrared heaters”, even though they have an infrared output rate below 25% (which means 25% of the input power is transferred into IR rays and 75% into normal convectional heat or heat/energy loss). Check Wikipedia for more information. INFRAPOWER panels have the highest efficiency rate in the market (tested by a leading Austrian laboratory). Our unique technique and the usage of the highest grade materials in the market guarantee an outstanding performance. As mentioned above, it is very important that a radiant panel produces IR rays at a certain high efficiency rate. However, it is of equal importance that most of the rays are in a particular bandwidth of the infrared spectrum. In cooperation with Japanese and Austrian technicians, INFRAPOWER has developed a special formula for its heating element and a unique reflector technique that 99% of the produced infrared rays are in the optimum IR spectrum. Infrared is electromagnetic energy. It is part of the electromagnetic spectrum which is made up of radio waves, microwaves, infrared, visible light, ultraviolet, x-rays, and gamma rays. In the electromagnetic spectrum, infrared falls in between microwaves and visible light waves. Its wavelengths are shorter than microwaves but longer than those of visible light. The prefix infra derives from the Latin word which means below. Thus, infrared means below red, indicating its position in the electromagnetic spectrum. Red is the color of visible light. Infrared is invisible to the human eye. 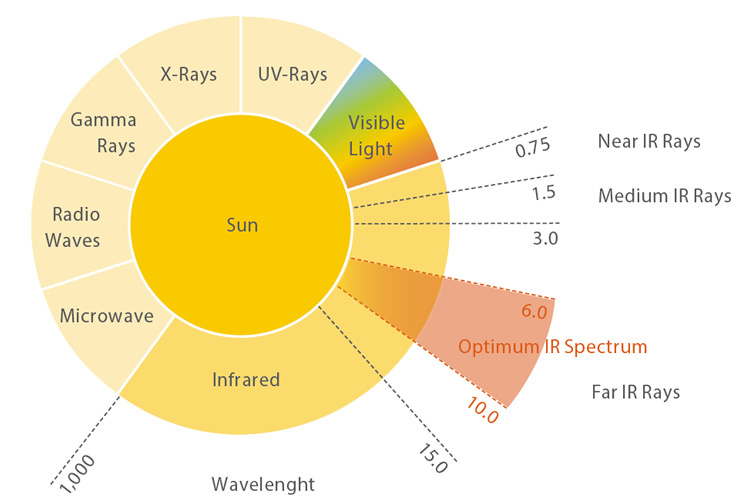 The sun also produces many different type of rays (from Microwaves to Visible Light and X-Rays, see graph above). Only rays which fall in a certain spectrum (0.75 to 15 microns) actually heat. These rays are called Infrared Rays (A) Near-, (B) Medium- and (C) Far IR Rays. 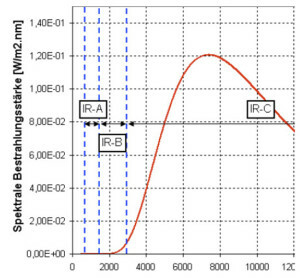 The best and most efficient spectrum for heating is the C Spectrum (Far IR rays, 6 to 10 microns). Therefore, it is essential that an infrared panel heater produces most of its IR rays in this optimum spectrum. INFRAPOWER panels produce 99,82% of its output in the C-range and more than 90% of it in the optimum spectrum of it (6 to 10 microns, see test report from Seibersdorf Laboratories, Austria). INFRAPOWER reaches this optimum spectrum with a patented formula of a very high grade Carbon Nickel mixture (developed by Austrian technicians) and a Nano Silver conductor (developed by Japanese technicians). All is coated by dielectric layer and 100% PE protection. A unique reflector technology emits all IR in one direction (no loss to back. The back gets hot but no IR rays are emitted in to the rear). Simple Test: Hold your hand 2cm behind the panel: you will not feel heat. No IR rays are emitted to the rear through INFRAPOWER’s unique reflector technology (optical mirror layer applied). Another important factor for reaching the optimum IR spectrum is that the heater panel performs at a certain temperature range. The less input power (W) used to achieve this certain surface temperature the better the panel (e.g. : a panel of same size with same surface temperature which use less power is better than a panel which needs more power to achieve the same surface temperature). INFRAPOWER panels are exactly in the mentioned temperature range. Furthermore, it is essential that the heat distribution on the surface is even. Only an even heat distribution (surface temperature) guarantees that the total input power (W) is used for working at best performance. Below please see the test results of INFRAPOWER. Converting infrared radiant energy into an image that the human eye can see and understand is the process called thermal imaging. This is achieved with the use of an infrared camera that accurately measures the temperature and translates it into color. Infrared imaging shows the heat distribution of certain bodies. 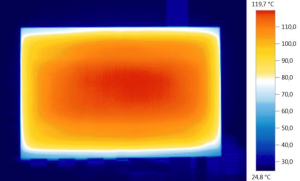 The image below shows the outstanding heat distribution of INFRAPOWER radiant panels (Tested with IR thermal camera). INFRAPOWER has the leading technology of far infrared panel heaters. Highest efficiency rates and lowest possible energy consumption of the infrared heating element is guaranteed. What all panels have in common is the unique CARBON NICKEL panel integrated, which performs better than all commonly used electric conductors. Our newly developed electric conductor, which is more durable than steel, generates the highest possible efficiency rate. Pressed in epoxy ceramic resin, INFRAPOWER panels can reach the optimal surface temperature, which give additional improvement in efficiency and therefore saving energy. As opposed to existing panel heat generators which simply use carbon paper or wires, INFRAPOWER panels use a new concept. Until now, due to the difficult processing and application technology, it is only produced by a few companies and only for special individual projects. INFRAPOWER improved the existing technology and we are able to offer our new technology at very competitive prices. High efficiency combined with our connection system and patented reflector technologies (100% of produced infrared rays are emitted to the front) make it possible, that only a very small percentage of convection heat is produced. This means you benefit from all advantages of infrared heating and efficient heating is guaranteed. Each panel is equipped with several built-in security sensors to protect the panel from overheating. The structure of the panel (the panel is protected both front and back by aluminum plates) guarantees 100% PE protection. As our main business is OEM production for many customers worldwide, the appearance of our infrared panels may differ. All panels that bear our name have INFRAPOWER’s high efficient heating element inside and customers can be assured of the outstanding quality and heating power. Highest infrared panel quality by INFRAPOWER! Our heating element (carbon fiber with nickel and nano silver conductor) was developed by Austrian technicians and laboratories (in cooperation with Japanese and German suppliers). INFRAPOWER uses this sign as an indicator of latest state of the art developments. It shows to final customers who trust European technology, the outstanding performance of our heating element. INFRAPOWER’s ‘Geprüfte Sicherheit’ (‘Tested Safety’) or ‘GS’ mark issued by TUV Rheinland Germany indicates that the equipment meets German and European safety requirements. In the GS test TUV check whether the product meets the requirements of the Product Safety Act and other legislation in ensuring the protection of the health and safety of persons. This includes the requirements of the European directives which are implemented with the Product Safety Act and its regulations (e.g. Low Voltage Directive and Machinery Directive). The GS mark means that a laboratory authorized by German state, has tested the product and production monitoring was carried out. The CE mark declares that INFRAPOWER’s products meet the requirements of the applicable EC directives. All our infrared panels comply with the ‘Low Voltage Directive’ and the ‘EMC Directive’. This certification shows that INFRAPOWER infrared panels are compliant to US and Canadian defined regulations which products, especially electronics equipment must fulfill before they can be approved for sale. This certification issued by TUV shows that INFRAPOWER is able to produce infrared panels for various requirements (for instance panels rated for 240V according to BRITISH STANDARD regulations). At this technology centre located in Austria (Europe), INFRAPOWER regularly tests the heating element. Further developing and improving it’s efficiency. Together with the technicians of Seibersdorf laboratories, INFRAPOWER is constantly trying to find new ways to increase the infrared output of the panels in order to meet customers’ expectations. Together with Austrian technicians and laboratories, INFRAPOWER is constantly improving and upgrading the efficiency of the infrared panels. As energy costs are rising worldwide, our aim is to provide economic heaters which work at highest efficiency ratio (percentage of electricity converted into emitted infrared waves). In research done by the University of Kaiserslautern in the winter season 2009/10 (Germany, Univ. Prof. Dr.-Ing. Peter Kosack), a German distributor compared INFRAPOWER panels with conventional gas heating. The result: up to 50% energy savings are possible with INFRAPOWER panels. Over a period of 5 months, two identical apartments (one apartment is located in second floor and the other one located in third floor) were tested. In one apartment traditional gas heating was installed and the in the other one only infrared panels were used to heat the rooms (only the water was heated with gas). The average consumption of gas and electricity per square meter was 187,85 kWh for gas heated apartment and 71,21 kWh for the apartment which was heated by infrared panels. This result shows that gas heater consumed almost 3 times more energy to heat the same rooms. In the meantime, INFRAPOWER panels improved both in efficiency rate as well as output of IR rays in the optimum IR spectrum. Around 10 to 15% further savings are guaranteed with the new patented technology of INFRAPOWER. The ratio of gas to electricity should be around 3.5 to 1 with the new INFRAPOWER technology. Depending on the gas and electricity price, the cost advantage using INFRAPOWER panels is different in each country (savings from 20 to 50% with INFRAPOWER panels). However, the factor mentioned above does not take the increase in gas and electricity prices over the last 10 years into account. Gas prices rise 7,1% per year on average. Electricity prices only rise 2,25% per year. In a few years in all countries around the world heating with INFRAPOWER will at least save 40 to 50%. Research done by European technicians shows that because of austerity measures implemented by many countries in the European Union, the ratio of gas and energy price increase is much higher than the mentioned normal increase of 7,1% for gas and 2,25% for electricity. Governments do increase gas/oil prices more in difficult economic times than they increase the price of electricity. Because of the more and more popular usage of solar and photovoltaic modules in recent years, the production of electricity is more independent from government control which also contributes to a lesser price increase of electricity. INFRAPOWER infrared-heaters do not require expensive piping, an electric socket is sufficient. The installation is done with screws to the wall, ceiling or mobile with the optional floor stands. Thanks to its timeless elegant design, the only 2.5 cm thick panels integrate harmoniously into any living area. In combination with optional room thermostats, INFRAPOWER infrared-heaters provide perfect heat according to your needs. Even in a single room several different thermal comfort zones can be generated. INFRAPOWER infrared-heaters convert 100 % of the energy consumed in comfortable warmth. They heat quickly and accurately – without any service and maintenance costs. The walls remain dry and the insulation properties are improved in the long term. INFRAPOWER infrared-heaters promote dust- and bacteria-free air, preventing the unpleasant dry circulation of convection heating. They keep the masonry free of mold and operate completely silent. The temperature is evenly spread throughout the room. No more cold feet and hot heads. INFRAPOWER has a common environment policy for the implementation and execution of environmental issues. INFRAPOWER’s infrared heater in combination with clean energy or photovoltaic systems are a perfect contribution to protect resources and the environment. No components include heavy metals (such as lead) or PVC which are harmful to the environment.